There’s salad. There’s pizza. And then there’s pizza salad. This ingenious recipe combines the flavors of both and let’s you enjoy all the delights of pizza in a 100% healthy way. From the creamy mozzarella to all of the fresh peppers, mushrooms, and onions you’d find on a veggie lover’s pizza, this low-carb version of everyone’s favorite Italian dish will make you wonder why no one thought of this sooner. We used fresh mozzarella bocconcini, but you can use shredded mozzarella, or even parmesan. Like other vegetables on your pizza, like artichoke hearts or roasted broccoli? Both would be a welcome addition here. Top it off with some crunchy Homemade Parmesan and Herb Croutons that taste like pizza crust, a tomato and oregano dressing that has the uncanny flavor of your local pizzeria’s secret sauce, sit back, and buon appetito! There's salad. There's pizza. And then there's pizza salad. 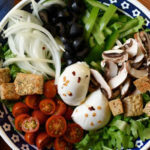 This ingenious recipe combines the flavors of both and let's you enjoy all the delights of pizza in a 100% healthy way. To make dressing, combine oil, vinegar, tomato sauce, and oregano in a small bowl; whisk to blend. Season with salt and pepper if desired. Set aside. 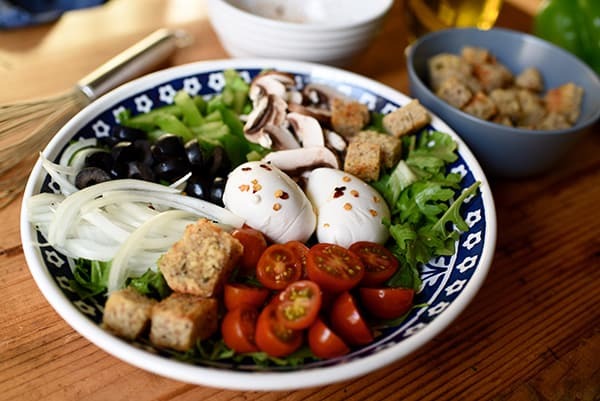 Combine arugula, romaine, basil, tomatoes, bell pepper, onion, mushrooms, olives, and dressing in a large serving bowl; toss gently to blend. Top with bocconcini and crushed red pepper (if desired); serve immediately.